Koerner, N., Mejia, T., & Kusec, A. (2017). What’s in a name? Intolerance of uncertainty, other uncertainty-relevant constructs, and their differential relations to worry and generalized anxiety disorder. Cognitive Behaviour Therapy, 46, 141 – 161. For link to abstract, click here. Vickers, K., Ein, N., Koerner, N., Kusec, A., McCabe, R., Rowa, K., & Antony, M.M. (2017). Self-reported hygiene-related behaviors among individuals with contamination-related obsessive-compulsive disorder, individuals with anxiety disorders, and nonpsychiatric controls. Journal of Obsessive Compulsive and Related Disorders, 14, 71 – 83. For link to abstract, click here. Kusec, A., Tallon, K., & Koerner, N. (2016). Intolerance of Uncertainty, Causal Uncertainty, Causal Importance, Self-Concept Clarity and their Relations to Generalized Anxiety Disorder. Cognitive Behaviour Therapy, 4(5), 307-323. For link to abstract, click here. Pawluk, E.J., & Koerner, N. (2016). The relationship between negative urgency and generalized anxiety disorder symptoms: The roles of intolerance of negative emotions and intolerance of uncertainty. Anxiety, Stress, & Coping. For link to abstract, click here. Tallon, K., Koerner, N., & Yang, L. (2016). Working memory in Generalized Anxiety Disorder: Effects of verbal and image-based worry and relation to cognitive and emotional processes. Journal of Experimental Psychopathology, 7, 72 – 94. For link to abstract, click here. Koerner, N., Tallon, K., & Kusec, A. (2015). Maladaptive Core Beliefs and their Relation to Generalized Anxiety Disorder. Cognitive Behaviour Therapy, 44, 1 – 15. For link to abstract, click here. Nowakowski, M., Antony, M.M., & Koerner, N. (2015). Modifying interpretation biases: Effects on symptomatology, behavior, and physiological reactivity in social anxiety. Journal of Behavior Therapy and Experimental Psychiatry, 49, 44 – 52. For link to abstract, click here. MacDonald, E.M., Pawluk, E.J., Koerner, N., & Goodwill, A. (2015). An examination of distress intolerance in undergraduate students high in symptoms of generalized anxiety disorder. Cognitive Behaviour Therapy, 44, 74–84. For link to abstract, click here. Fracalanza, K., Koerner, N., & Antony, M.M. (2014). Testing a procedural variant of written imaginal exposure for generalized anxiety disorder. Journal of Anxiety Disorders, 28, 559 – 569. For link to abstract, click here. Fracalanza, K., Koerner, N., Deschenes, S.S., & Dugas, M.J. (2014). Intolerance of uncertainty mediates the relation between generalized anxiety disorder symptoms and anger. Cognitive Behaviour Therapy, 43, 122 – 132. For link to abstract, click here. Henderson, L., Antony, M.M., & Koerner, N. (2014). Psychometric properties of the Generalized Anxiety Disorder Inventory (GADI) in a Canadian sample. Journal of Psychopharmacology, 28, 440 – 448. For link to abstract, click here. Ogniewicz, A.S., Dugas, M.J., Langlois, F., Gosselin, P., & Koerner, N. (2014). The Word-Sentence Association Paradigm for generalized anxiety disorder: Assessing interpretation bias. Journal of Experimental Psychopathology, 5, 457 – 476. For link to abstract, click here. Koerner, N. (2014). The importance of taking an integrative approach to the study of worry, intolerance of uncertainty and generalized anxiety disorder. Canadian Psychology, 55, 44 – 47. For link to abstract, click here. MacDonald, E.M., Koerner, N., & Antony, M.M. (2013). Modification of interpretive bias: Impact on anxiety sensitivity, information processing and response to induced bodily sensations. Cognitive Therapy and Research, 37, 860 – 871. For link to abstract, click here. Gee, B., Antony, M.M., & Koerner, N. (2013). Disclosure of anxiety in everyday life: Effects of social anxiety. Personality and Individual Differences, 54, 438 – 441. For link to abstract, click here. Gee, B., Antony, M.M., & Koerner, N. (2013). How do people perceive the disclosure of emotion?Cognitive Therapy and Research, 37, 579 – 586. For link to abstract, click here. Koerner, N., Antony, M.M., McCabe, R.E., & Young, L. (2013).Changes in beliefs about the social competence of self and others following cognitive-behavioral treatment. Cognitive Therapy and Research, 37, 256-265. For link to abstract, click here. Pawluk, E.J., & Koerner, N. (2013). A preliminary investigation of impulsivity in generalized anxiety disorder.Personality and Individual Differences, 54,732-737. For link to abstract, click here. Anderson, K., Dugas, M.J., Koerner, N., & Radomsky, A.S., Savard, P., & Turcotte, J. (2012).Interpretive style and intolerance of uncertainty in individuals with anxiety disorders: A focus on generalized anxiety disorder. Journal of Anxiety Disorders, 26, 823 – 832. For link to abstract, click here. Deschenes, S., Dugas, M.J., Fracalanza, K., & Koerner, N. (2012). The role of anger in generalized anxiety disorder. Cognitive Behaviour Therapy, 41, 261 – 271. For link to abstract, click here. Gee, B., Antony, M.M., & Koerner, N. (2012). Do socially anxious individuals fear embarrassment by close others? Development of the Fear of Embarrassment by Others Scale. Personality and Individual Differences, 52, 340 – 344. For link to abstract, click here. Gee, B., Antony, M.M., Koerner, N., Aiken, A. (2012). Appearing anxious leads to negative judgments by others. Journal of Clinical Psychology, 68, 304–318. For link to abstract, click here. Vorstenbosch, V., Antony, M.M., Koerner, N., & Boivin, M.K. (2012). Assessing dog fear: Evaluating the psychometric properties of the Dog Phobia Questionnaire. Journal of Behavior Therapy and Experimental Psychiatry, 43, 780 – 786. For link to abstract, click here. Hood, H., Antony, M.M., Koerner, N., & Monson, C.M. (2010). The effects of safety behaviors on fear reduction during exposure. Behaviour Research and Therapy, 48, 1161-1169. For link to abstract, click here. Koerner, N., Antony, M.M., & Dugas, M.J. (2010). Limitations of the Hamilton Anxiety Rating Scale as a primary outcome measure in RCTs of treatments for generalized anxiety disorder. American Journal of Psychiatry, 167, 103-104. For link to abstract, click here. Cloutier, A., Marchand, A., Dugas, M.J., O’Connor, K., Koerner, N., & Roberge, P. (2009). Analyse comparative de l’utilisation de services de santé associée aux troubles anxieux [Comparative analysis of health care use in the anxiety disorders]. Revue Québécoise de Psychologie, 30, 199 – 215. Koerner, N., & Dugas, M.J. (2008). An investigation of appraisals in individuals vulnerable to excessive worry: The role of intolerance of uncertainty. Cognitive Therapy and Research, 32, 619-638. For link to abstract, click here. Dugas, M.J., Savard, P., Gaudet, A., Turcotte, J., Laugesen, N., Robichaud, M., Francis, K., & Koerner, N. (2007). Can the components of a cognitive model predict the severity of generalized anxiety disorder? Behavior Therapy, 38, 169-178. For link to abstract, click here. Dugas, M.J., & Koerner, N. (2005). The cognitive behavioural treatment of generalized anxiety disorder: Current status and future directions. Journal of Cognitive Psychotherapy, 19, 61-81. For link to abstract, click here. Koerner, N., Dugas, M.J., Savard, P., Gaudet, A., Turcotte, J., & Marchand, A. (2004). The economic burden of anxiety disorders in Canada. Canadian Psychology/Psychologie canadienne, 45, 191-201. For link to abstract, click here. Koerner, N., & Fracalanza, K. (2012). The role of anxiety control strategies in imaginal exposure. In P. Neudeck & H-U Wittchen (Eds. ), Exposure therapy: Rethinking the model – Refining the method (pp. 197-216).New York, NY: Springer Press. Koerner, N., Vorstenbosch, V., & Antony, M.M. (2012). Panic disorder. In P. Sturmey & M. Hersen (Eds. ), Handbook of evidence-based practice in clinical psychology: Volume II – Adult disorders. Hoboken, NJ: John Wiley and Sons. Koerner, N., Hood, H., & Antony, M.M. (2010). Interviewing and case formulation. In D.H. Barlow (Ed. ), Oxford handbook of clinical psychology. New York: Oxford University Press. Koerner, N., Rogojanski, J., & Antony, M.M. (2010). Specific phobia. In M. Reinecke & S. Hofmann (Eds. ), Cognitive-Behavioral Therapy with Adults. Cambridge, UK: Cambridge University Press. Antony, M.M., Pickren, W.E., & Koerner, N. (2009). Historical perspectives on psychiatric classification and anxiety disorders. D. McKay, J. S. Abramowitz, S. Taylor, & G. Asmundson (Eds. ), Current perspectives on the anxiety disorders: Implications for DSM-V and beyond. New York: Springer. Koerner, N., & Dugas, M.J. (2006). A cognitive model of generalized anxiety disorder: The role of intolerance of uncertainty. In G.C.L. Davey & A. Wells (Eds. 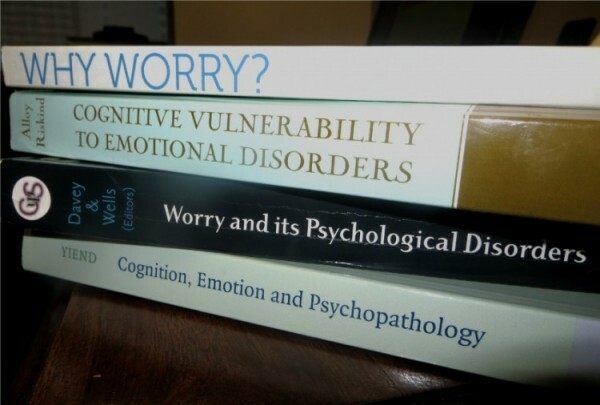 ), Worry and its psychological disorders: Theory, assessment & treatment.Chichester: John Wiley and Sons, Ltd.